Are you leading a business, new or old? I’ve done both: I’ve started businesses from scratch and I’ve also taken over leading a business that was already a few years into the game. Either way, the difference between success and failure is what you and your team are working on…and when! Caution: If you entrepreneurs out there don’t grasp this, your business is very likely to fail (especially my friend who’s spending a couple of hours a week figuring out Quickbooks instead of focusing on making money!). My marketing-guru friend and previous business partner Eben Pagan inspired the money-making pyramid (he called it the “productivity pyramid” in his awesome GetAltitude “Top Gun For Entrepreneurs” program — it’s a neat visual using a pyramid to illustrate what’s most important to work on in a business. I’ve riffed a bit so blame me (not Eben) if you don’t like my “Money-Making Pyramid” version. 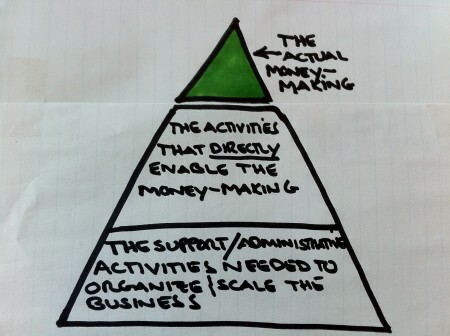 The money-making pyramid illustrates that the money-making in your business belongs at the top (most important) with the items below it less important the lower down on the pyramid. I was thrilled when I saw that Geoff Smart and Randy Street of ghSMART came out with the book Who: The A Method For Hiring on how to improve hiring. If you are involved in any hiring, I suggest you acquire this book right now! You may recall that I had an incredible experience studying under Topgrading guru Brad Smart (Geoff’s father) in Chicago a few years ago with Eben Pagan and some of the Hot Topic Media gang — that meeting inspired this post: A Mis-Hire Costs You 13X That Person’s Salary: Why You Must Topgrade. I was stunned recently when, within 15 minutes of a concert I attended, I found a potential buyer for my 94 year-old Grandma’s summer cottage 2,000 miles across the country. I found a potential buyer for my Grandma's house at a....Jerry Garcia Tribute Concert!? This wasn’t just luck — although you could argue that the tips I’m going to share are all ways to increase your luck…or serendipity as I like to call it. Either way, it was a positive thing…so I re-engineered what happened and am sharing the three tips below. And I really like these 3 networking tips cuz all are real easy to do and remember. The first thing I did was to attend an event I knew I’d enjoy. A friend had invited me to a “Tribute To Jerry Garcia” concert put on by the REX Foundation…and I’m a huge live music/Jerry Garcia fan! I remember when my friend Eben Pagan shared the concept of Inevitability Thinking with me — it’s such a simple yet powerful approach to achieving your objective…damn, why didn’t I think of that!? The easiest way for me to share Inevitability Thinking is to give an example (I’m going to use a hypothetical example of an Internet business I want to build). But, if you want, you can just read my version of this exercise first. First step is to articulate your objective. For this exercise, let’s assume your objective is to build a content-based Web site that generates $20,000 per month in advertising revenue. 2) Identify Your Time Frame? Easy next step: let’s pick a time period to meet your objective of $20,000 in ad revenue per month. We all want to reach our goals immediately…but let’s be realistic: how does one year sound? After all, most things that matter in life take time. Ok, this is still super-easy. Now you just identify what levers to pull to make it imperative to achieving your objective. I call these inevitability levers because they are imperative to your objective. Let’s start at the very top-line of levers you’ll be working with. Note: down below we’ll drill down deeper into a few mini- levers within these inevitability levers. You do have to get your hands a little dirty on this one. Next up, you’re going to start to make assumptions about your inevitability levers. The key tip about your assumptions is to make them realistic/conservative: afterall, we’re trying to make it inevitable that you’ll achieve your objectives (don’t be overly optimistic). Advertising revenue is a pretty simple formula: you’ve got to price your ads and you’ve gotta sell your ads. Let’s start with ad pricing: what’s a conservative assumption we can use on how much you can make from an online advertisement? I searched “average CPM (CPM stands for cost per thousand impressions) of an online ad” and I found that $2.43 is a good average CPM for the Internet as a whole, according to Comscore. note: I also found a cool graph in this Adify Report that showed CPMs for different vertical markets such as Automotive, Beauty/Fashion, Business, Moms and Parents, Sports, Technology, Travel, Real Estate, Healthy Living/Lifestyle, News and Food (the CPMs in this graph were much higher (average of $7.71 but you want your objectives to be inevitable so lets be conservative and use the $2.43 figure instead). Ok, let’s use the average CPM of $2.43; if we use that, then that means you’ll generate $2.43 for every 1,000 impressions (aka page views) of your Web site. To keep things simple, let’s assume that you’re just selling one ad on every page of your Web site. Now we need to figure out how much volume of ads you need to sell (since we’re selling one ad per page, we can just call what we’re looking for: “page views” (i.e. each time someone views a page of your content, one ad is served). 8,230,452 page views that you would need to generate $20,000 in ad revenue. What would make it inevitable that you would generate 8.23M page views? The answer: a certain number of “visits” to your Web site. On the Internet, a page view is generated by a visitor visiting your site and looking at a certain number of pages. Ok, back to assumptions (and don’t forget to be conservative about your assumptions…after all, we’re trying to make it inevitable that you’ll achieve your objective!). And don’t put your calculator away just yet either! So we need to use another assumption for how many pages a visitor would view to continue our math. You can go Google your particular vertical, but let’s keep things simple and assume that a conservative estimate is that an average visitor will view 5 pages each time they visit your site. So, if you had 1.65M visits it would be inevitable that you would generate 8.23M page views and thus $20,000 in ad revenue (using your conservative assumptions of course!). How the heck am I gonna get 1.65M visitors to my Web site (in a month!)!? 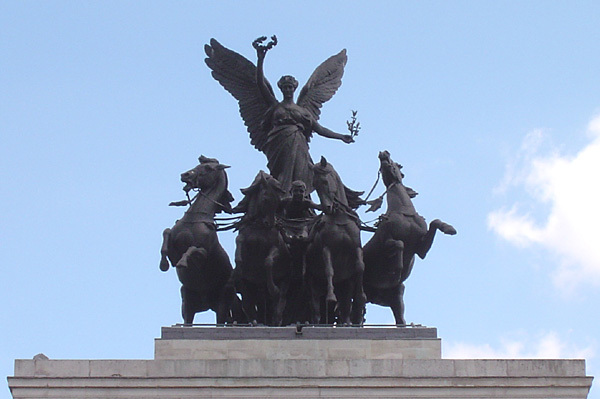 All are good approaches and you could apply inevitability thinking to any of them…but let’s keep it simple. Let’s say you believe that your Web site’s content can help you attract traffic (remember, content is your other core lever!). Ok, so how much content would you need to make it inevitable that you would attract 1.65M visitors per month? Ok, you’re gonna have to make some more assumptions…this time around content. Let’s say that you find that on average your competition generates 100 visitors per month for each page of content that they have (by the way, an example of one page of content would be this article you’re reading right now). Ok, I know, it sounds like a lot of content. But, remember, this is one year from now. And, actually, there are tons of Web sites who generate hundreds of thousands of pages of content with little cost (beyond engineering time and hosting cost). They get their voluminous content from users (aka “user-generated content”) and many of them do it merely by providing a quality bulletin board or question and answer service. SEOBook tells me they have 8 million pages indexed by Google (note: they were founded in 2000 so they’ve been doing this for 10 years)…and they provide this primarily through offering a Q&A service for engineers. StackOverFlow claims more than 1M visitors every month…now we’re talking! Ok, so now what would make it inevitable that you generated 165,000 pages of content? Well, let’s assume for the moment that you’re going to do a blog instead to generate your content. Let’s assume that you can write 3 blog entries a day or about 1,000 per year (I’m giving you a couple of weeks of vacation time! )…well, to get to 165,000 pages of content that would take you 165 years! The oldest living man right now is only 114 so let’s go to plan B. Well, there are actually free multi-user blogging platforms that allow you to let others blog beyond just you! So, let’s assume that you can get other writers like you to post 3 blog entries per day (around 1,000 per year with a few vacation days for them too (you’re no slave-driver!). Ok, so now what would make it inevitable that you could sign up 165 Blog Writers. Did I Mention You’ll Have To Google A Few Things In This Exercise? Let’s look around for a writers group…Googling “writers group” gives me WriterMag, a magazine with more than 30,000 writers. Ok, so what would it take for you to convince 160 of those 30,000 writers (.533% of them) to write for your blog (many writers might do it for free just for publicity!). Let’s assume that you talked to WriterMag’s ad sales team and they told you that they were super-confident that if you ran a full-page black and white ad in their magazine — offering their 30,000 readers free publicity on your blog — every month for six months that it would be inevitable that you would get your 160 bloggers. Well, such an ad looks like it would cost about $10,000 according to the rate card on their Web site (you can often get discounts to “rate card” and my guess is that you’d get at least 25% off for a 6-month commitment (times are tough for the publishing industry!). So, a commitment by you of $7,500 should get you the 6 months of full-page ads. Ok, we’re wrapping it up now. This is of course a simplified version of how you’d really conquer your objective (the devil will be in the details and you’re going to have to do your homework on levers, assumptions and the approaches you use). But the point is: if your levers and assumptions are roughly correct, you will roughly achieve your objective through this approach. I hope you found this inevitability thinking exercise useful. I heard a cool thing listening to a GetAltitude interview of Brendon Burchard by my business partner Eben Pagan in my car this week– Brendon mentioned four things an expert needs to do to be successful. I love frameworks so I’ve listed the four items that Brendon mentioned below along with my take on each. Listing just the framework felt dull so I decided to give an example of each step using the topic of “Social Media? (since Social Media “Experts” are high in demand these days). An expert needs to break down the abundance of information available to most people into just a handful of key bullets. You need to tell customers what things mean and why they are important. Continuing on the Social Media example, you would tell your audience that social media is critical to their business because it can generate half of their Web site traffic. And this traffic can be unpaid (i.e. you don’t have to pay direct advertising costs to do it). Experts should focus on how different pieces of something work…as well as how they all work together as a whole. Blogs are most useful for your business as a content delivery platform through which your team shares medium-length content about the direction you see your business and industry heading. Overall: All four of the above can work in concert with your blog acting as your centerpiece promoting your Facebook Fan page, Twitter address and URL for your YouTube videos. A good expert shows their audience the future. If you work on these four things, there’s no doubt you’ll improve your reputation as an expert in your field. Thanks for the idea, Brendon!